True Wild Life | Bonobo | The bonobo is a large species of primate that is only found in the Democratic Republic Of The Congo in central Africa. The bonobo is also known as the pygmy chimpanzee and the dwarf chimpanzee as the bonobo is thought to be very closely related to the chimpanzee and the two species share very similar characteristics. The bonobo is thought to have evolved from the ancestors of the common chimpanzee millions of years ago when the Congo River was formed. Today, the bonobo lives south of the Congo river and chimpanzees live north of the river meaning that they have evolved as two separate species. Along with the chimpanzee, the bonobo is believed to be one of the closet living relatives of the human. The bonobo shares 97% of the same DNA that makes up humans and the bonobo displays very similar behaviour to humans as far as social interaction and reproduction are concerned. Along with a number of other primate species (including humans) the bonobo has opposable thumbs which allow it to grip onto food and trees. The bonobo is smaller than the chimpanzee with adult bonobos averaging around 70cm in height and weight roughly 40kg, The bonobo has black hair covering it's body that is parted on it's head, pink lips and long legs. 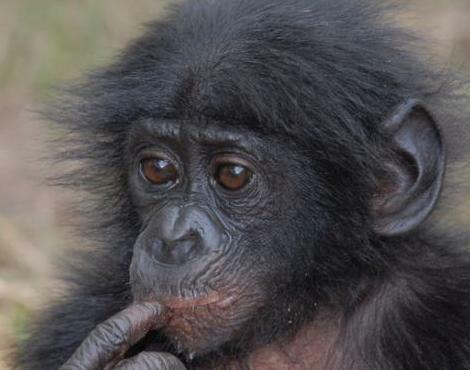 Generally, the body of the bonobo is not as hairy as the body of their chimp cousins. The bonobo is an omnivorous animal mainly feeding on vegetation such as fruits, leaves, flowers, bark and seeds. The bonobo also eats honey, eggs, insects and even small mammals and reptiles. The bonobo has also been known to turn to cannibalism (eats other bonobos) in captivity but it is unknown whether or not this happens in the wild. Due to it's large size and the ability of the bonobo to escape into trees, the bonobo has few natural predators in the African forests. The main predators of the bonobo are humans who hunt the bonobo for it's meat and the odd crocodile when the bonobo gets close to the water. It is thought that other large primates may prey on the bonobo in the wild but that will often be down to disagreements over territory that turn nasty. 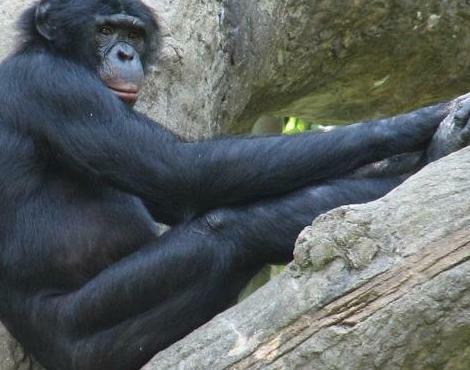 As with many other species of large primate, the bonobo spends a great deal of time on the ground looking for food and resting with the bonobo troop. Bonobos are also known to climb into the trees if they feel threatened or are search of culinary delicacies such as honey. 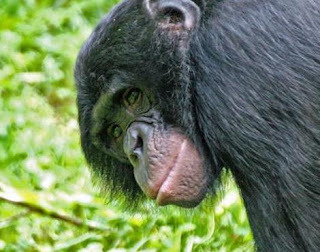 Bonobos inhabit areas of the forest in troops which usually contain the alpha male bonobo, a number of females bonobos and their offspring. 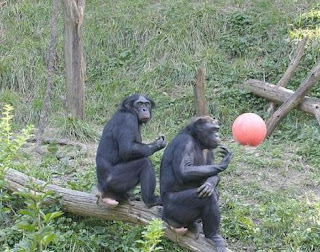 The bonobo troop feed together and warn off unwelcome animals along with social interacting through calls and grooming. 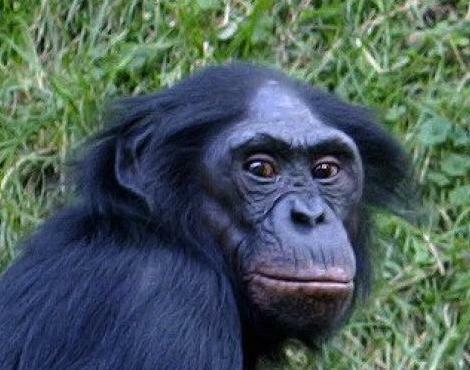 Female bonobos breed roughly once every few of years and there has been not specific breeding season observed. After a gestation period of around 8 months, the female bonobo gives birth a single bonobo baby. The bonobo baby is nursed and cared for by the mother bonobo until it is between 3 and 6 years old. The male bonobo babies are known to be more dependent on their mothers and the female bonobo babies are more independent at a younger age. A female bonobo can expect have between 5 and 7 babies in her 40 years lifespan. Today, the bonobo is considered to be endangered animal with only 10,000 bonobo individuals thought to be left in the wild. The bonobo populations have declined dramatically due to hunting an habitat loss. 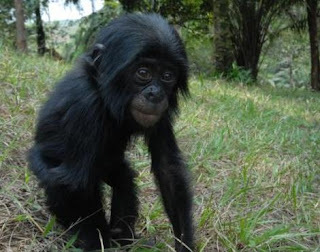 The civil unrest in the region has also made the bonobo populations more vulnerable.